Labels with QR codes and Widgit symbols are now tied to various objects in the Museum of English Rural Life with (soft) tape supplied by the Museum Conservator. 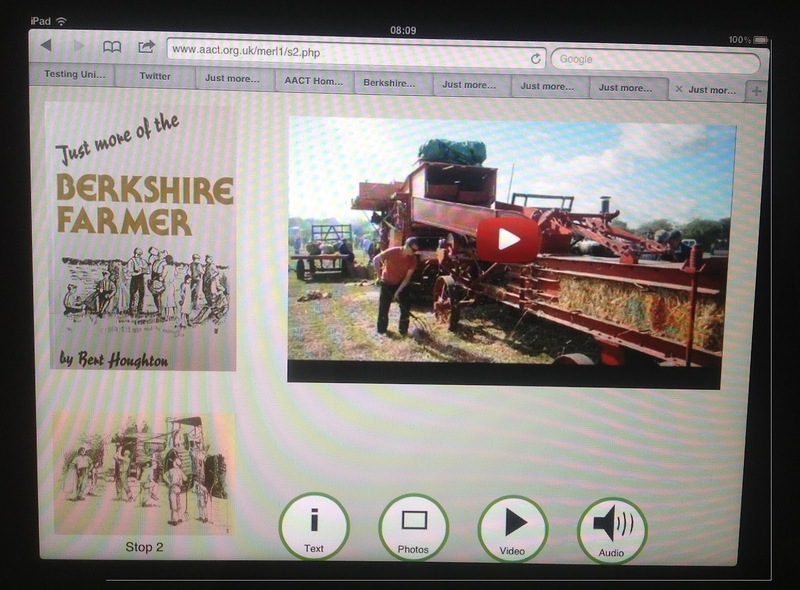 We’ve started to let visitors try it for themselves on our iPad-on-a-trolley. 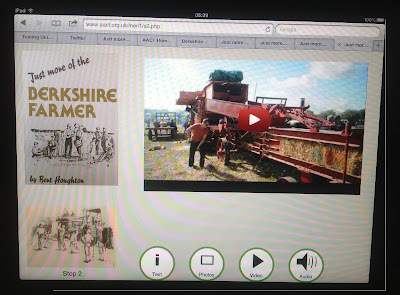 Video, especially of the thresher, was popular yesterday, as was breaking out to draw corn and ‘countryside’ on the iPad and take transformed photos. Some visitors who are not iPad-users find the concept of ‘tap’ [the buttons] don’t ‘push’ (as you would with an ordinary button) difficult. Not being able to play a video as soon as a QR code is scanned (for example) is nasty and seems to be an iPad ‘quirk’ which has no (believable-rational) explanation. The Kiosk Pro app has been useful to run demos of the trail where no wi-fi or wireless signal is available (especially good for Country Fayre in a marquee) but of course we need a signal when, say, a Youtube video forms part of the trail. If the iPad is online, the app is not ‘allowed’ (?) to use the camera. Odd ‘features’ like this make it difficult to produce a really sound (ergonomically) ‘webapp’. It may just be impossible to have a perfect solution for loaned-out iPads. The situation is different with the users’ own devices of course – they will know how to tap/scroll etc and the museum will not have to worry about the visitors accessing other sites on the web – it will be up to the visitor. We have two versions of the ‘app’. One for each stop on the trail, intended for use by a visitor standing in front of an object, and with access to the QR code. The other which can be used ‘standalone’ with arrow keys to take you from one stop to the next.